When Marine Sgt. Deano Miller was preparing to return home from a deployment in Afghanistan, he desperately wanted to say goodbye to his best friend. "They said they'd give us time to say goodbye," Miller recalled. "They didn't." Miller's best friend was not a fellow Marine, but rather a Labrador retriever named Thor — a military working dog who had to stay on deployment in the combat zone. "In our program, we only get to deploy with our dog, and as soon as we get back our dog has to go away and he deploys with someone else," Miller said. Other Marines in his unit were excited to be home, but for Miller, something was missing. "I stole his collar, kept it, still have it," Miller said, laughing after choking back the tears that came when remembering that day in 2010. "I just wanted my dog back. I didn't care about anything else." After serving five additional deployments with five different handlers, pursuing his critical specialty in bomb detection, Thor — now a military retiree — and Miller were finally reunited in May, this time for good. "As soon as we got home ... he was following me around from Day One," Miller said. "He'll be passed out on our lap in the living room, I'll get up and leave and boom, gone, right after me. He's my shadow." The American Humane Association has teamed up with Mission K9 Rescue, an organization that helps retired service dogs, to provide monetary and transportation support for the animals to be reunited with their original handlers or be adopted by families. 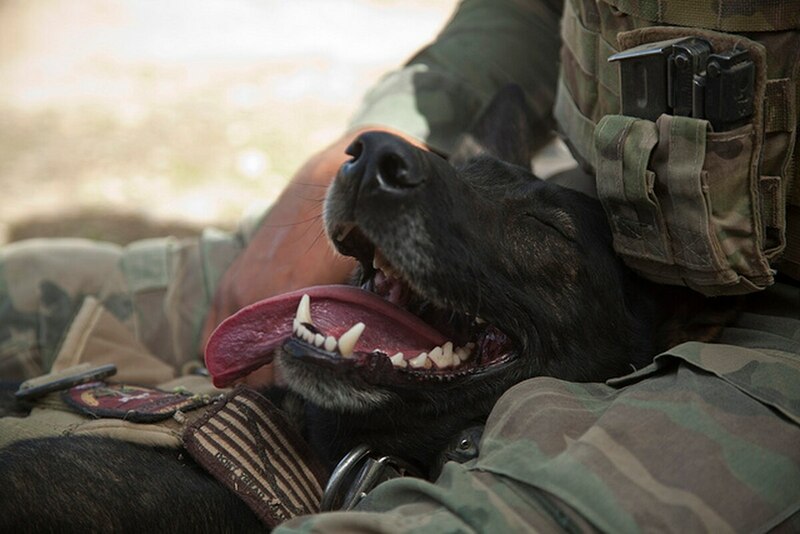 Nearly 600 military and contract working dogs are supporting U.S. operations overseas, said Robin Ganzert, president and CEO of the American Humane Association. With noses that are almost 100,000 times more sensitive than those of humans, they have a unparalleled ability to sniff out weapons caches and IEDs, she said. "It's estimated that each military dog saves the lives of 150 to 200 service men and women," Ganzert said during an event Wednesday in Washington designed to build support for bringing all four-footed veterans back to the U.S. where they were trained for duty. Several retired service dogs — Thor included — were in attendance. Ganzert said the AHA believes working dogs' original handlers, "who have the strongest bond with these animals," should be given the first chance to adopt after the dogs are retired from military service. "The American Humane Association and Mission K9 Rescue have gotten tremendous and well-deserved attention for bringing these faithful battle buddies back together. They have done so much for our nation," said Rep. Gus Bilirakis, R-Fla. In the past four months, eight veteran dogs were brought home to U.S. soil and four more are in the pipeline waiting to come back, Ganzert said. Army Staff Sgt. James Harrington, who suffers from post-traumatic stress disorder, spent four years with his dog, Ryky, a Belgian Malinois, who was trained as a specialized bomb detection dog. Harrington had to part with Ryky when his last deployment to Afghanistan ended in 2011 and the dog had to remain deployed. In June, the pair was reunited with the help of Mission K9 Rescue, and they appeared at the Capitol Hill event together. Harrington said that while dog handlers understand the mission and recognize what the dogs are deployed for, that doesn't make it any easier to leave them behind. "But, our brothers came back home," he said. Military working dogs sometimes are classified as equipment, although that's changing; the Air Force, for example, is making a policy change that no longer classifies working dogs as gear. "It bothers me that these dogs, who have served our country with courage and with valor and with honor that these dogs are referred to as equipment," Ganzert said. "We applaud the Air Force agreeing to make the change in their manuals to get them out of that equipment status." The bond between a handler and a military working dog goes deeper than "man's best friend," Harrington said, since the teams go through the same harrowing stresses of combat duty togethe4r. "We both battle with some of our issues together," Harrington said of Ryky. "I'll never call her my pet. She'll always be my partner." The American Humane Association also is hoping to help alleviate the financial burden of health care for military working dogs, who are usually heading toward their twilight years when they are retired. "We are creating a fund for retirement care of military working dogs and contract working dogs to make sure that these dogs are afforded with medical care they need, so they can live a retirement in dignity," Ganzert said. But the care pipeline does not run just one way. For Miller, it's also about how Thor is helping to care for him. Miller said he didn't realize he had developed any problems from his combat deployments until he came home and began having what he described as anger issues. "I'd lash out every now and then and I didn't sleep very well," he said. "Thunderstorms ... I'd wake up at like two o'clock in the morning and I'd just be crying. I would be so stressed." He said he would often end up waking his fiancee in a panic. Now, when he experiences such episodes, he wakes up and sees his old four-legged war buddy. "He looks at me, wags his tail, and I'm good."